We had a nice, quiet Sunday. The sky was unexpectedly overcast but the air was spring-like so we got out to enjoy it a bit. 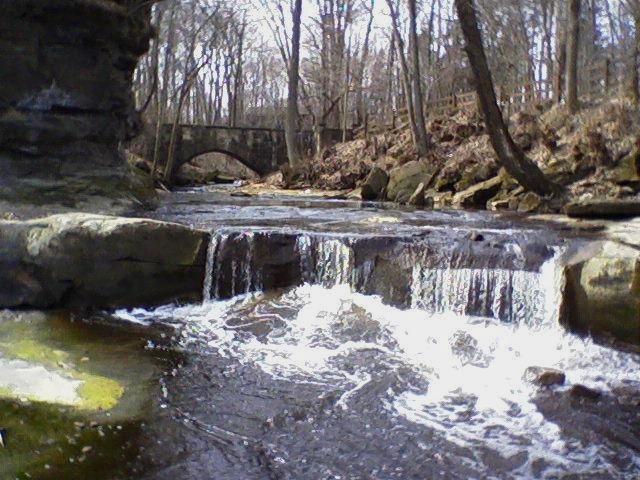 Ran a couple of errands and stopped for a visit to Olmsted Falls. We visited a couple of interesting little shops in town, and checked out a vintage freight depot building that had been moved to the town's rehabbed downtown area. We looked around inside the re-purposed town fire station that is now the Moosehead Hoof and Ladder #3 restaurant — clean, bright, welcoming and sure to see us returning … as customers! Then we took a short walk in beautiful Fortier Park, on the river. Walking rocks in and around the water is a favorite activity of mine. I'd neglected to bring a good camera with me so shot a photo using my cell phone, mostly as a reminder to myself to return with something better! That is a really nice photo – even if it is with a mobile phone. It is certainly better than my poor little mobile will take.